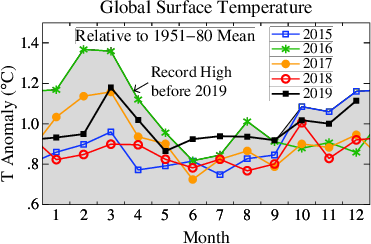 Add 0.28 to the global mean temperature anomalies with 1951-1980 base period to convert to anomalies relative to pre-industrial levels. 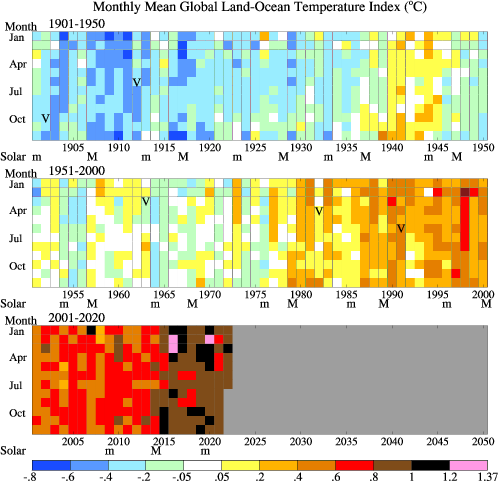 Monthly (thin lines) and 12-month running mean (thick lines or filled colors in case of Nino 3.4 Index) global land-ocean temperature anomaly, global land and sea surface temperature, and El Nino index. All have a base period 1951-1980. Figure also available in PDF. 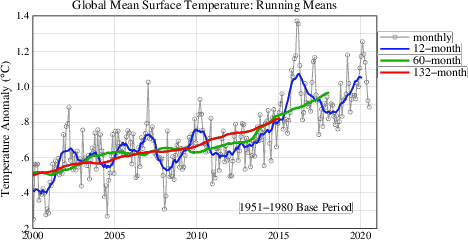 The monthly mean temperature anomalies over land (data) and over ocean (data) are available. (Data through March 2019. last updated 2019/04/15, now with GHCN version 3.3.0 and ERSST v5. For Nino 3.4 SST see El Nino/La Nina page (last modified 2019/03/04) for data source and more information. Updates of a figure in Hansen, et al. 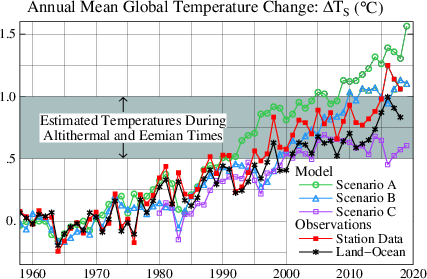 Global temperature change, 2006, PNAS. 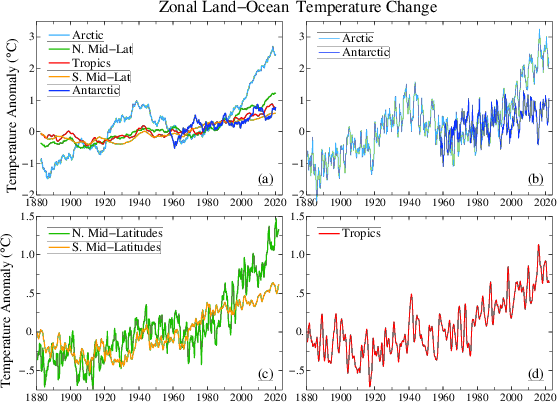 We take the 1880-1920 global mean temperature as our best estimate for the pre-industrial value. However, the spatial coverage of stations is not good for that period (no Antarctica data, e.g. ), so for the global maps we use 1951-1980 as the base period. Some other groups keep advancing their 30-year base period each decade, so that it is now 1981-2010. 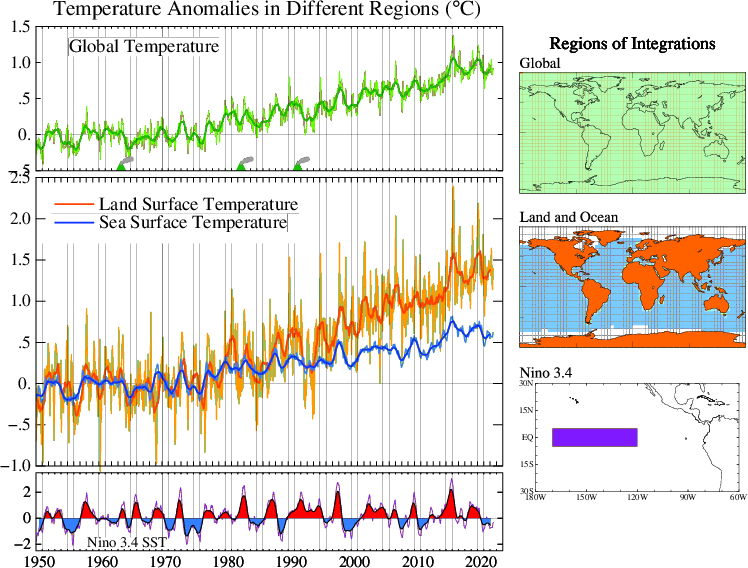 The above maps show the temperature change between these periods.